We have had our CorkSport brand products out on the race track this year in several venues. 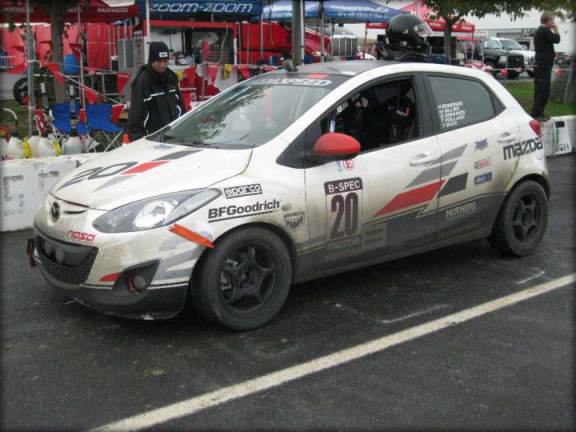 The first was Dobson Motorsports Mazdaspeed 3 in the USTTC series and the other in the Mazdaspeed Motorsports Mazda 2 at the NASA 25 hour Thunder Hill endurance race. 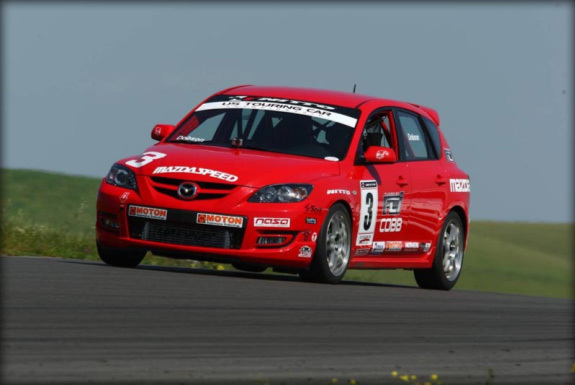 The Dobson Motorsports Mazdaspeed 3 in the USTCC was driven by Ken Dobson and Gary Sheehan for the 2010 season. The Mazda finished 2nd in the championship for the year missing the championship by 1 point. The car placed first 3 times during the season. The car builder Greg Garneau chose the CorkSport Ram Air Front Mount Intercooler kit and CorkSport Turbo Back Exhaust for the major power adders during the construction of the Mazdaspeed 3. The car ran great the entire race season with the only mechanical problem coming up was a cooling issue from a radiator problem. The Mazdaspeed 3 is tuned to a maximum of 270 wheel horsepower due to the class rules but the torque is unlimited which puts the Mazdaspeed 3 at an advantage due to the output of the Mazda 2.3 DISI engine. 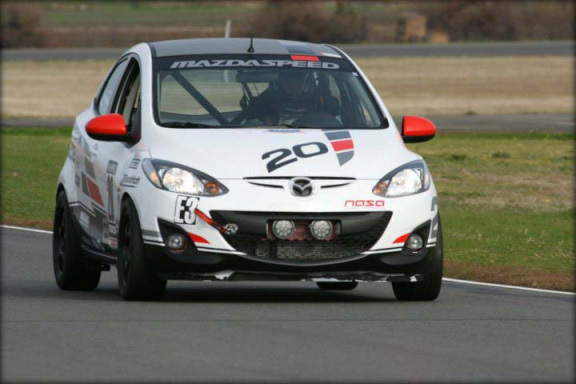 The Mazda 2 was built by Mazdaspeed Motorsports to showcase the just announced B Spec race series. The modifications are limited for the B-Spec class to suspension, safety, and some bolt on performance parts. 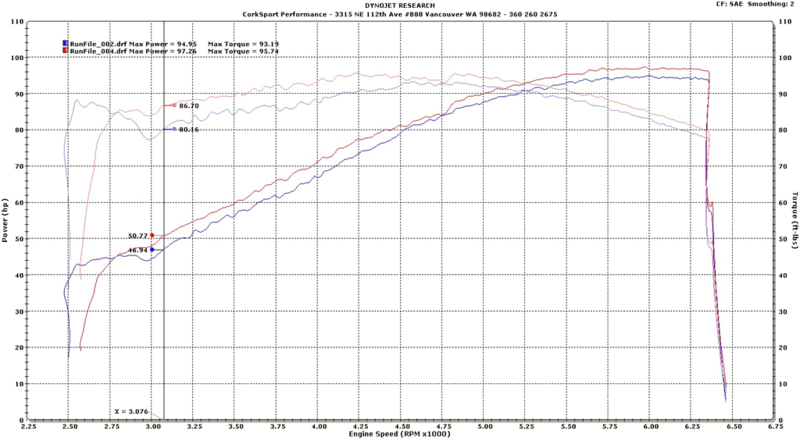 We supplied the newly released CorkSport Short Ram Intake to give the 2 some extra power for the 25 hour non stop race. 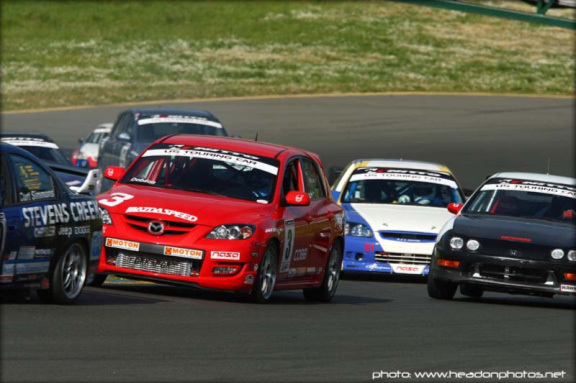 The Mazda 2 performed well during the race with no mechanical problems. There were several offs while racing do to the weather conditions (lots of rain). I was told by one of the drivers Tim Buck, “Everyone that drove went off. The weather was pretty ugly, and if you didn’t go off occasionally you just weren’t trying hard enough”. I would like to thank Greg Garneau and Tim Buck for the information about the cars and the racing I used in the blog post. If you have been using your CorkSport products in any racing, pro or amateur we would like to hear from you. Feel free to email me with any information. Your new 2 doesn’t look like my new 2. And those fat tires and wheels, The race. Other than no mechanical problems in 25 hours, how competitive were you generally? Are you sharing what changes were made to the car? If a B series, will or can the car remain street legal.